Donald Trump is coming off one of his roughest weeks as president, at least in his critics’ eyes - instigating a government shutdown fight, provoking his defence chief’s resignation, abruptly pulling US troops from two global hot spots, and even thinking about firing the head of the US central bank. Yet, as hard as it is for the outside world to comprehend, the president and his advisers think all that upheaval adds up to a winning hand. By digging in on his threat to shut down the government to try to force Congress to fund his border wall on the southern US border, and by drawing down military commitments in Syria and Afghanistan in line with his "America First" doctrine, Trump’s satisfying the demands of his most dedicated supporters - and he knows they’re the only ones who can keep him in the presidency, said advisers inside and outside the White House. To Trump, it’s merely an extension of his 2020 re-election mantra: Promises made. Promises kept. "President Trump believes one of his strengths is he is actually doing the things he told people he would do," said Marc Lotter, a member of Trump’s 2020 advisory committee and former spokesman for Vice President Mike Pence. "One of the reasons why the president was elected was because we have had politicians of both parties for many, many years saying one thing on the trail, in the commercials and from the podium, and doing another." In one way, Trump is right. Activist Republican voters, who can punish GOP lawmakers not viewed as sufficiently loyal to Trump, are also his surest line of defense as Special Counsel Robert Mueller’s investigation moves closer. 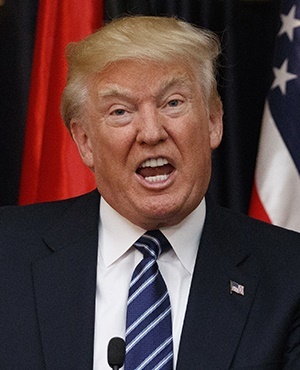 Should the incoming Democratic-controlled House impeach Trump - a threat many around Trump consider very real - he could survive and remain in office as long as at least 34 Republican senators stick with him. Democrat Bill Clinton survived the last impeachment in just this way. Yet even some of Trump’s allies now seem unnerved. Senate Majority Leader Mitch McConnell, who rarely criticises the president in public, said he was "particularly distressed" by Defence Secretary James Mattis’s departure. Republican Senator Lindsey Graham said the decision to pull troops out of Syria and cut in half the US military presence in Afghanistan risks "paving the way toward a second 9/11". Republican Representative Dennis Ross of Florida said he and his GOP colleagues are growing increasingly anxious. "Whether it be defence or monetary policy, we want to see some stability," Ross said. A sense of disarray in Washington as the federal shutdown neared contributed to a rout in the stock market. The Dow Jones Industrial Average had its worst week since the 2008 financial crisis, and the technology heavy Nasdaq Composite plunged into a bear market. And that was all before a Bloomberg News report late Friday that Trump was talking openly to advisers about firing Jerome Powell, the head of the nation’s central bank - whose independence from the president is a bedrock feature of the US financial system. Negative reaction from senior Republicans was swift and intense, with Republican Senator Richard Shelby warning Trump to "be very careful". Trump has made clear in public comments and tweets that he believes Powell is hurting the US economy and contributing to stock market losses - two things that need to be strong to improve Trump’s re-election chances. Late Saturday, he had to back down. Treasury Secretary Steven Mnuchin posted a pair of tweets quoting Trump as not only denying any plan to fire Powell but disavowing authority to do so. Any move to fire Powell would create immediate "market chaos," said Peter Conti-Brown, a professor at the University of Pennsylvania’s Wharton School - Trump’s alma mater. "It would represent a governance crisis that would damage the Fed, damage the presidency, and damage the nation." Even so, advisers said Trump feels emboldened, not chastened, by the midterm elections -despite the net loss of 40 House seats, his party’s worst in the chamber since Watergate in the 1970s. His aides have spun that as a win since it fell short of the 63 seats Democrats lost in 2010, and they have emphasised Republican pick-ups in the Senate in Florida, Indiana, Missouri and North Dakota. As a result, Trump feels vindicated in his political instincts and is increasingly unmoved by advisers, they said. He’s now ready for a reset and a shake-up of his Cabinet to surround himself with advisers more aligned to his political outlook, and he’s coming to the view he should have done so from the start of his administration. When he ran for president, Trump presented himself as a candidate who would bring troops home from the Middle East, and he’s no longer willing to let his generals dissuade him. He now regrets going against his instincts last year when he approved a plan to send thousands more troops to Afghanistan at the urging of foreign policy advisers, said a person familiar with the process. On Monday, Trump underscored the "America First" approach to global affairs that he used to rally voters in a response to the backlash over Mattis’s departure. "We are substantially subsidising the Militaries of many VERY rich countries all over the world, while at the same time these countries take total advantage of the US, and our TAXPAYERS, on Trade," Trump tweeted on Monday. "General Mattis did not see this as a problem. I DO, and it is being fixed!" Some of the Republican Party’s most vocal conservatives, particularly members of the House Freedom Caucus, consider the struggle over border wall funding a test of whether Trump will hold his ground and prove he won’t buckle under the pressure of a Democratic-controlled House. They consider that paramount, regardless of any discomfort it may cause moderate Republicans - a shrinking part of the GOP’s Congressional delegation - and independents. In the days before the federal shutdown, Trump shifted from signalling he might acquiesce to a stopgap measure to temporarily fund the government after a backlash from right-wing media personalities. Radio host Rush Limbaugh fumed on his show that, "Trump gets nothing, and the Democrats get everything." Conservative commentator Ann Coulter told the Daily Caller’s podcast that his administration risked becoming a "joke presidency that scammed the American people" if he wasn’t able to build a border wall, and that she wouldn’t vote for his re-election if he didn’t. Later, she tweeted out a column headlined, "Gutless President in Wall-Less Country." Trump certainly noticed. He stopped following Coulter’s Twitter feed shortly afterward. But the criticism cut to the core. With Democrats taking control of the House next month, Trump sees this as his last likely chance to secure funding for the border wall, fulfilling one of his most crucial promises of the campaign, his advisers say. By Friday, he was girding for a fight, declaring himself "totally prepared for a very long shutdown".